Dr. Jacinto-Francisco was excellent. She took the time to listen to my concerns and discuss different options. The waittime was a bit longer than expected but the thoroughness of the visit made up for that. Dr. Jacinto-Francisco was excellent. She took the time to listen to my concerns and discuss different options. The wait time was a bit longer than expected but the thoroughness of thevisit made up for that. Kind, attentive and warm. I felt that she took her time and actually asked questions. Sad to say, but i haven'thad that experience with any doctor in years. She was great! Kind, attentive and warm. I felt that she took her time and actually asked questions. Sad to say, but i haven't had that experience with any doctor in years. She wasgreat! 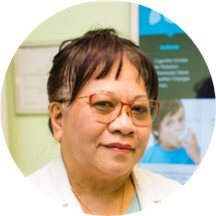 A physician specializing in OB-GYN, Dr. Gertrudes Jacinto-Francisco works at the practice of James R. Peri, MD. She earned her medical degree from the University of Santo Tomas Faculty of Medicine and Surgery. Currently based in Brooklyn, NY, Dr. Jacinto-Francisco concluded her residency in obstetrics and gynecology at Interfaith Medical Center. She is renowned for providing thorough medical care for a host of reasons, which include birth control/contraception, menopause consultations, pregnancies, vaginal discharge/infections, and pregnancy nutrition checkups. Dr. Jacinto-Francisco’s goal during consultations is to help women build a routine that will allow them to better prepare their bodies for successful pregnancy and childbirth. She is eager to be able to serve women at all stages of life. Answered all questions I had and overall, made me very comfortable. Very kind and considerate! Very sweet and understanding. Dr. Francisco is a very professional physician. Throughout the whole visit, I feel very relaxed. She is knowledgeable, she know what’s she doing. Her explanation is very thorough. Does not rush to get the patient out of the office. Highly recommended. What an awesome doctor!!! I would give her a ten star if I could !!! She makes u feel super comfortable Very caring and funny !!! Very knowledgeable and pleasant doctor. She was really great! Answered all of my questions and made me feel very comfortable! Finally found a doctor I can stick with! Waited an hr to be seen. Even though I arrived 15 mins before my appt. but the visit was very pleasant. She addressed all my concerns and everyone there seems very professional. The office is very clean and spacious. The receptionists were very helpful and the doctor was very friendly and patient, she had a great bedside manner! Amazing office with wonderful attentive staff. I tend to feel uneasy in medical offices but I was met with warmth which helped keep me calm. Highly recommended!